Rooting for promo tickets to international destinations? Read the Philippine Airlines Seat Sale for 2017 for foreign trips this weekend! 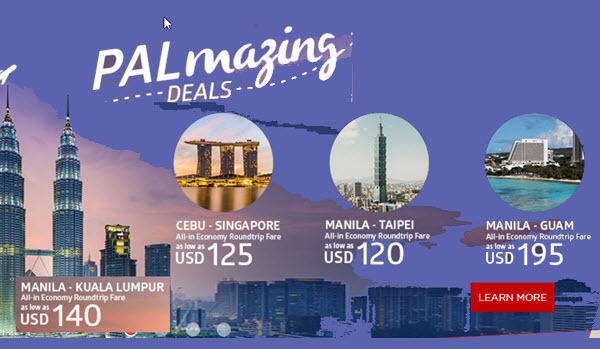 Featured routes on this promo are the Manila to Kuala Lumpur, Manila to Taipei, Manila to Ho Chi Minh, Manila to Guam and Cebu to Singapore. The Philippine Airline promo tickets can be used for your pre-Christmas or Christmas holidays. Except the Guam trip, the other routes travel dates are until December 31, 2017. Sale tickets are good for round trip travel. Promo fares include 7 kilos hand carry bag, base fare, government taxes/fees and terminal fee. Free checked baggage for Guam is 2 pieces at 30 kilos each. For Kuala Lumpur, Taipei, Ho Chi Minh and Singapore, free checked baggage allowance is 30 kilos. Want to travel to these awesome destinations? Booking your cheap tickets until May 7. Book or buy the low fares the soonest possible time. Sale tickets are limited! Avail the PAL promo tickets by booking online at www.philippineairlines.com or book a tour package via swingaround.philippineairlines.com. Here is a sample booking of PAL Sale Ticket Manila to Taipei. Are you bringing children or infants on your travel? Child fare is charged at 80% of adult ticket price while infant’s ticket rate is 10% of adult fare. Mileage accrual applies to these promo fares. Change fee is USD 100 while no-show fee is USD75. Grab the opportunity to travel via the amazing affordable tickets of Philippine Airlines! Book now! For more promo fares 2017- 2018, PISO FARE of Philippine Airlines, Cebu Pacific and Air Asia, LIKE and FOLLOW our Facebook: PISO FARE TICKET!! !